With the way people like to cook these days, it seems like home kitchens are just getting bigger and bigger. While that’s all well and good for people who have spacious enough homes to allow for such a thing, not all of us are so blessed! Some of us, whether we want to or not, are stuck with small kitchens! Here’s the thing, though: Just because your kitchen is small, that doesn’t mean you can’t have the features of those larger kitchens you keep seeing pictures of. Specifically, it doesn’t mean you can’t incorporate an island into your small kitchen’s design! As you’ll see while looking at the small kitchens on this list, islands can work wonders! Of course, you’re going to see plenty of built-in islands, just like the ones you’ve likely had your eyes on. On this list, pay attention to the number of small kitchens that make use of the floating island! 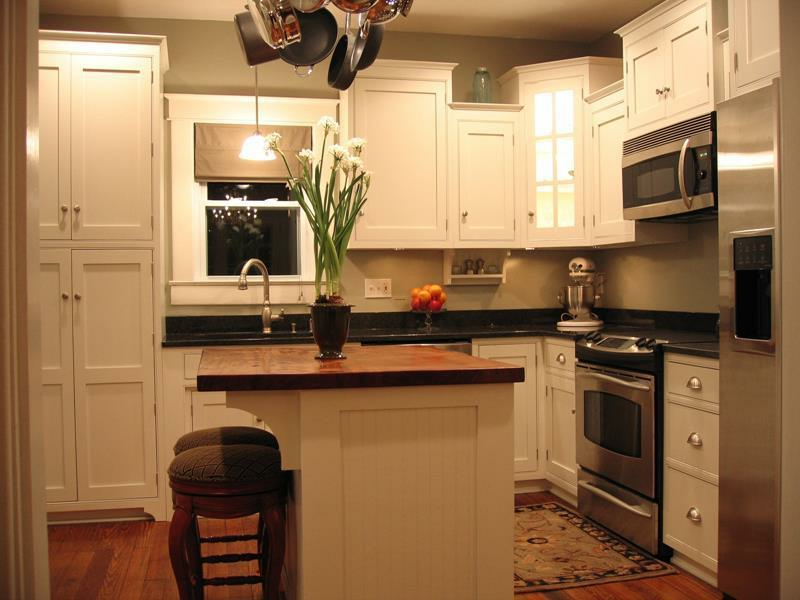 In many cases, having an island in your small kitchen that can easily relocated is the best course of action! In either case, don’t get green with envy thinking about all those huge kitchens you see elsewhere. With smart design, your small kitchen can be bigger in terms of aesthetics and functionality than the biggest kitchens there are! In this small kitchen design, visual interest is added by making the center island light blue in contrast to the white cabinets. With barstools at the island, this small kitchen design is as attractive as it is comfortable and cozy. By adding an elevated counter space at the island, this small kitchen design adds increased functionality.